The Steca Solsum F solar charge controller series is widely popular in small solar home systems with a 6 to 10 Amp solar charging and load current capacity (up to 240 Wp). 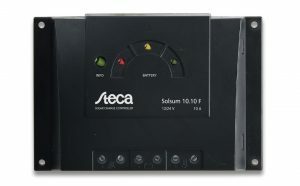 Large connection terminals, fully covered PCB and an easy to understand display are all advantages of the Steca Solsum F solar charge controller series. Solsum F-series has a completely electronically protected circuit board and is based on the low loss Series PWM control working principle.